Thought it was high time to pull out some designer paper and just play. My card is a 5.25″ square and it starts out with a layer of designer paper that’s been distressed with ink. 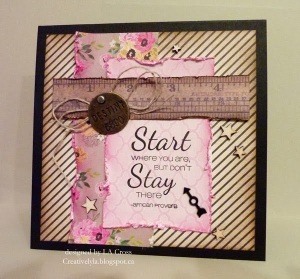 Next comes a rectangle in a coordinating design where the left edge has been distressed and inked. The focal point is yet another piece of designer paper that’s been distressed and inked. The ruler has been cut from some Tim Holtz paper, distressed and inked too. A couple of Tim Holtz doo-dads, some twine and a scattering of stars and done! Next Next post: what 29 again?